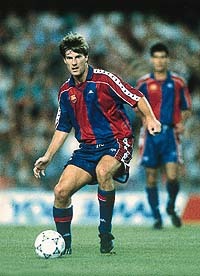 “Michelino” Laudrup was the artist of the Dream Team, a creative striker of such elegance that it was often joked that he was the kind of player that could play in a coat and tails. goals, totalling 93 in 288 games for Barça. Along with that, he left the club having won a host of major titles. After a season of confrontations with the coaching staff, he signed for Real Madrid in summer 1994. But despite that astonishing move, the magic of “Enjoy” will never be forgotten at the club. Last edited by Cristiano_Naniano on Tue Feb 25, 2014 9:22 pm, edited 1 time in total. There's no any reason for RES 87, it should be 82 like in the 1st set..